<!-\\Default - single specific --> An entrepreneur, Roland and his wife Nathalie implemented an adopt a forest program in the St. Leonard area of New Brunswick. He has also organized and launched a youth sleepover summer camp for 75 youth children and young adults ages aged nine to 14 to learn about conservation issues. Furthermore, Roland volunteered in a hatchery and enjoys camping, wildlife photography and outdoor sports. 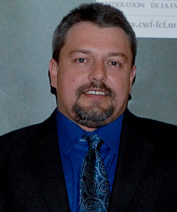 Roland is a member of the CWF Audit Committee and also sits as a Trustee on the Canadian Wildlife Foundation Board.